About a month ago, a commenter on the chimichurri recipe post, Val, posted a couple great tips on the use and preparation of chimichurri. 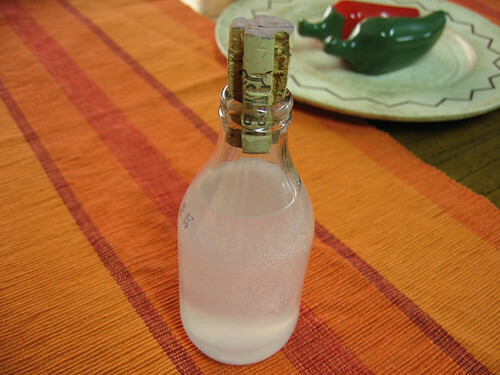 (btw, if you want to spread the word here on your own tips please feel free to do so) One of them was a makeshift seasoning bottle out of an old wine bottle and cork. Any bottle will work as long as the cork snuggles nicely into the opening. A friend of mine made one once with one of those little glass Coca-cola bottles. 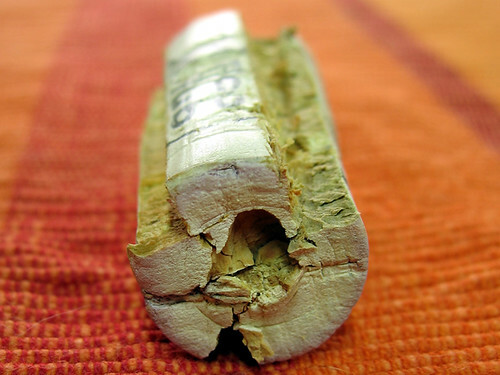 Basically what you do is cut a few wedges out of the cork along the length. How many or how big depends on how much liquid you want to flow out. Fill the bottle with your seasoning of choice (chimichurri, brine, lemon juice, etc), plug it up, and shake away on top of those meats cooking away on the grill. If using chimichurri, just plop that bottle on the table when serving time arrives. If you decide to try this out, please use extreme care, and cut at your own risk. Yes, you alone, will be at fault if you slice your hand or cut off any digits during the process. I will say that cutting on top of a towel greatly reduces the chance of the cork spinning and slipping away.